Repotting is continuing and with record high temperatures I am chasing the shade around the garden trying to find a cool spot. Aberdeen recorded its hottest day since records began with a temperature of 31.4C, way too hot for me; this last week has seen temperatures in the mid twenties most days. It is amazing to experience the difference in temperature between an open sunny spot in the garden and a cool spot in the shade of trees and shrubs - not much wonder the erythroniums like to be shaded. I grow a lot of Erythroniums in these deep polystyrene (Styrofoam) boxes that have been carved and painted to look like stone. Erythronium bulbs tend to take themselves very deep in the garden making it very difficult to dig them up to split them without causing damage. I opt for these deep boxes which makes it very easy to get at the bulbs and split them up every year or two to speed up the rate of increase. I place the box upside down in a wheel barrow and, with a rather serious face as I count down the ten second delay on the camera, slide the box off. This leaves the compost still in the shape of the box with the bottom up showing the remains of the roots and one bulb that has taken itself to the base. This box is for one of the forms of Erythronium tuolumnense that we grow. The first bulb of Erythronium tuolumnense I got was the most commonly offered form that to my mind is not the best of this species. It tends to have big leaves and small flowers on a stem that barely clears the leaves, not the best selection. I know grow a number of forms, both raised from seed and acquired from older collections, that are much better with showy flower stems held well clear of the leaves. One of the best things about Erythronium tuolumnense, and the reason that it is one of the most commonly seen species for sale is that it increases quickly by division of the bulb. As each bulb will make two or three offsets each year it is important to split them on a regular basis or they get congested and fail to flower so freely. This is possibly the reason you quite often read that it does not flower very well - not the plants' fault but the gardeners'. Like all bulbs, Erythroniums give us clues to what they want by their shape. It is obvious that these pot grown bulbs want to be much deeper. The elongated shape pushing down into the compost and where it hits the bottom of the pot it continues growing, turning through 90 degrees unless it finds a drainage hole. Then they just keep on growing down into the plunge below - I have to be very careful when lifting the pots. 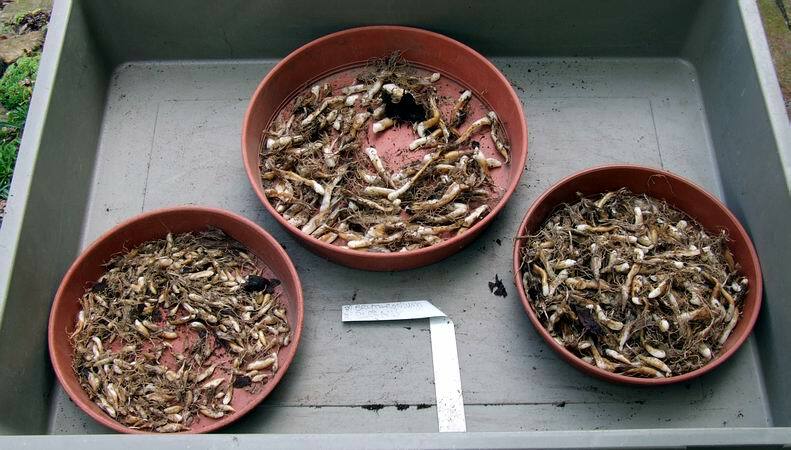 It is quite a common occurrence to find the bulbs growing below the pot rather than in it especially if they have not been repotted for a year or two. These are seedling Erythronium elegans bulbs, sown in 2002, the largest of which could flower next year. 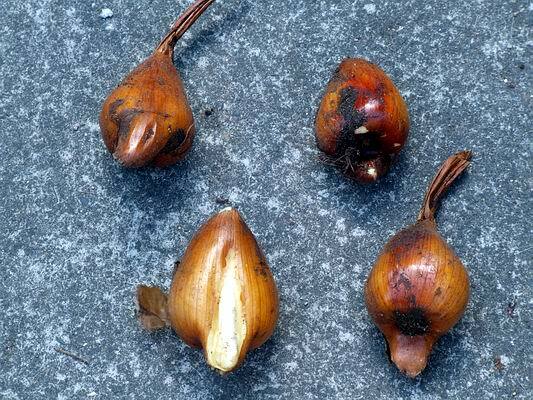 You can get an idea from the picture of the range of sizes of the bulbs from quite small to almost full size, all from the same sowing. The reason for this is two fold; firstly there is always a sporadic germination with most seeds germinating in the first year, some the second and a few in the third. The main reason for the large number of small bulbs is that Erythronium elegans is another species that makes offsets. Not large flowering sized offsets like those of Erythronium tuolumnense seen above but small offsets at the base of the old stem, even on quite young non-flowering bulbs. The Eurasian representatives of the genus, like Erythronium dens canis, do not have the same urge to delve ever deeper into the soil and this can be seen from the shape of the bulb - they tend to be shorter and fatter. NOTE FROM MAGGI; THIS CAN BE TRUE OF OTHER SPECIES; EG; I WOULD NEVER GO POTHOLING, AND YOU DON'T GET MUCH SHORTER AND FATTER THAN ME! Erythronium dens canis bulbs also retain the remains of the old bulb which, if left, makes a chain attached to the bottom of the bulb. I should mention that unlike true bulbs such as Narcissus which each year add more layers to themselves, erythronium bulbs act a bit like a corm and replace themselves annually. The remnants of the previous years' growths that form these chains remain dormant as long as they are attached to the main bulb but if removed, or the main bulb dies off, then there are dormant buds along the chain that will become active. I routinely remove the chains and grow them on separately to speed up the rate of increase. 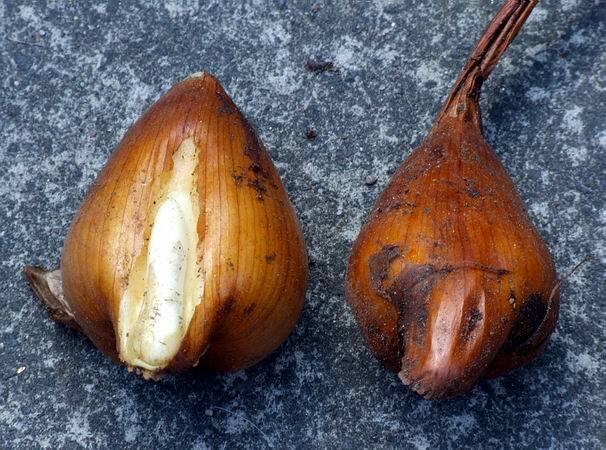 Colchicum bulbs also seem to want to go deeper and we can see the 'foot' pushing down from the bottom of the bulbs. Again, Colchicum bulbs replace themselves each year with a new bulb forming at the base of the stem. Here I have carefully split and removed a section of the bulb tunic to reveal the bud for next year which is the foot. Like Erythronium the new stem arises from the side of the colchicum bulb and not from within the bulb like Narcissus and other true bulbs. While repotting the boxes of erythroniums I often find self seeded orchids. 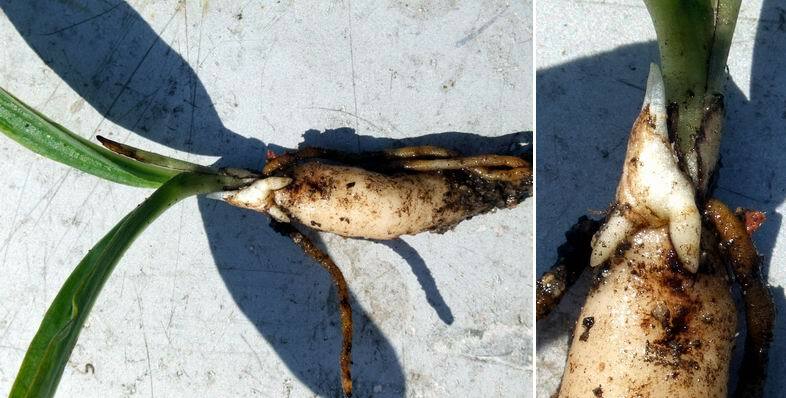 This gives me an opportunity to show a picture of a young Dactylorhiza tuber which already has next year's baby tuber growing piggy back at the base of the stem - I will show in a later log how we can use this feature to improve the rate of increase we get from Dactylorhizas. While checking some of the frames I was lucky to spot that one group of Crocus pelistericus had set seed and the seed pods had extended very rapidly over a few days and were at the point of shedding the seed. 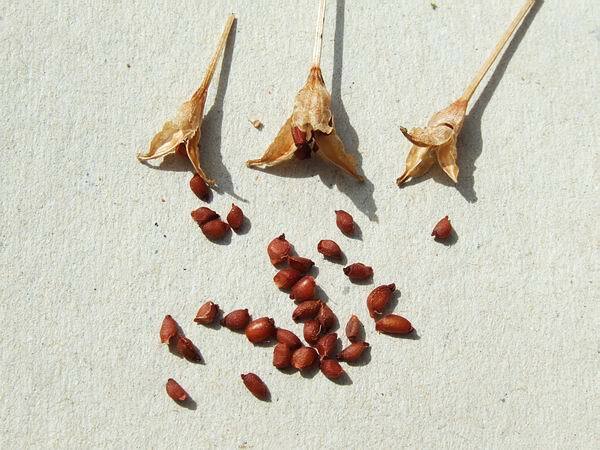 It is only occasionally that we get a seed set on our Crocus pelistericus. Most of the Crocus pelistericus we have is clonally increased . I was very pleased to have caught the seed just in time to harvest and grow on in pots. I hope the resulting plants being different clones will be more likely to set seed on a regular basis. 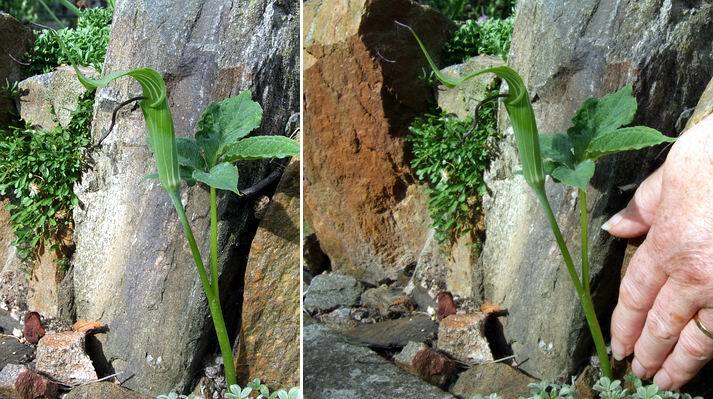 A wee Arisaema sp. that has appeared in one of our raised beds pictured here with Maggi's hand to give some idea of scale. I am not sure if this is the true size of the plant or if it is as a result of it growing in a lean crevice scree. At the other end of the scale and growing to eye level in the shade of trees and shrubs, are the stunning spotted orange flowers of Lilium pardalinum, raised from wild collected seed. This is a variable species whose flowers can vary from yellow trough to orange. 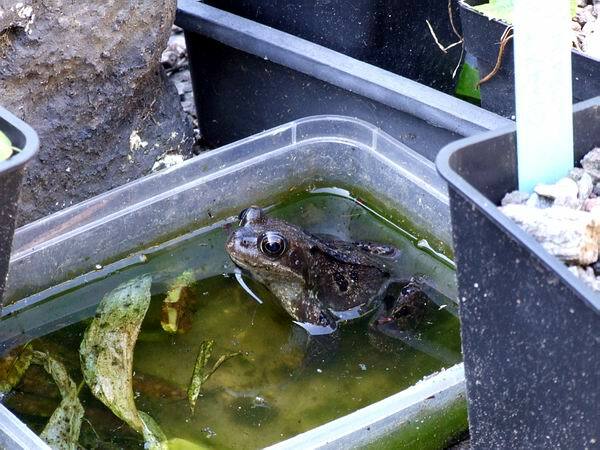 I was not the only one seeking out a cool shady spot in this heatwave, a garden puddock (frog to the non-Scottish speaking readers) enjoys a cool bath in amongst the clutter of pots.